Robert Wickens suffered severe spinal injuries during crash at Pocono. Verizon IndyCar Series driver Robert Wickens is recovering from surgery at Lehigh Valley Hospital-Cedar Crest in Allentown, Pa., to stabilize a thoracic spinal fracture associated with a spinal cord injury sustained during the INDYCAR event at Pocono Raceway on Sunday. Titanium rods and screws successfully were placed in Wickens’ spine during the surgery, which was performed late Monday without complication. Severity of the spinal cord injury is indeterminate at this time. Wickens is expected to undergo further surgeries to treat fractures in his lower extremities and right forearm. Wickens, who also sustained a pulmonary contusion, remains in stable condition. Further updates will be provided when available. Wickens was injured in a violent multiple-car crash on Lap 7 of the ABC Supply 500 on Pocono’s 2.5-mile “Tricky Triangle” layout in Long Pond, Pa. An MRI was instrumental in revealing the most appropriate surgical course for Wickens, a series rookie with Schmidt Peterson Motorsports. The race was delayed nearly two hours by a red-flag stoppage for track catch-fencing repairs following a five-car incident triggered by Wickens and the car driven by Ryan Hunter-Reay of Andretti Autosport. Wickens originally was reported as “awake and alert” when attended to at the crash scene by the AMR INDYCAR Safety Team and INDYCAR Medical staff. It took safety personnel approximately 12 minutes to extricate the Canadian native from the wreckage. Hunter-Reay was uninjured but visibly shaken. James Hinchcliffe _ Wickens’ SPM teammate and fellow-Canadian; 2016 Indy 500 champion Takuma Sato and series rookie Pietro Fittipaldi _ whose cars also were collected in the incident _ likewise were uninjured. Alexander Rossi went on to score his third victory of the season for Andretti Autosport by 4.4982-seconds in front of Team Penske’s Will Power, the reigning Indianapolis 500 champion who started on-pole. Rossi, who began the race 46 points behind championship leader Scott Dixon, closed to within 29 points of the Chip Ganassi Racing ace with three races remaining on the schedule. The top 10 drivers in points remain mathematically alive for the championship heading into the Bommarito Automotive Group 500 presented by Axalta and Valvoline at Gateway Motorsports Park in Madison, Ill., outside St. Louis on Saturday night. The race will air live at 8 p.m. (EDT) on NBC Sports Network and the Advance Auto Parts INDYCAR Radio Network. 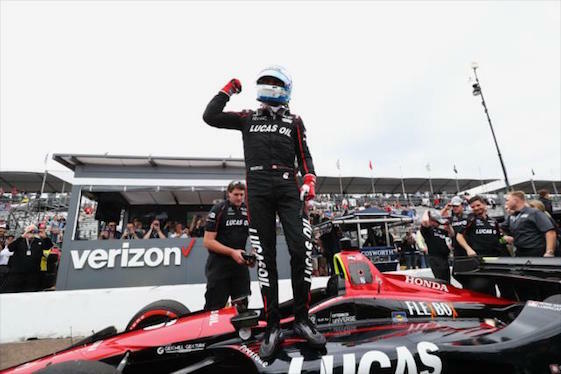 Verizon IndyCar Series point standings _ 1, Scott Dixon, Chip Ganassi Racing, 530; 2, Alexander Rossi, Andretti Autosport, 501; 3, Josef Newgarden, Team Penske, 464; 4, Will Power, Team Penske, 449; 5, Ryan Hunter-Reay, Andretti Autosport, 411; 6, Robert Wickens, Schmidt Peterson Motorsports, 391; 7, Simon Pagenaud, Team Penske, 368; 8, Graham Rahal, Rahal Letterman Lanigan Racing, 351; 9, James Hinchcliffe, Schmidt Peterson Motorsports, 338; 10, Sebastien Bourdais, Dale Coyne Racing, 325.